From our Italian Mid Century Furniture collection department a new set of fantastic chairs are ready to be shipped and fulfill the home of one passionate collector of 20th Century Design. 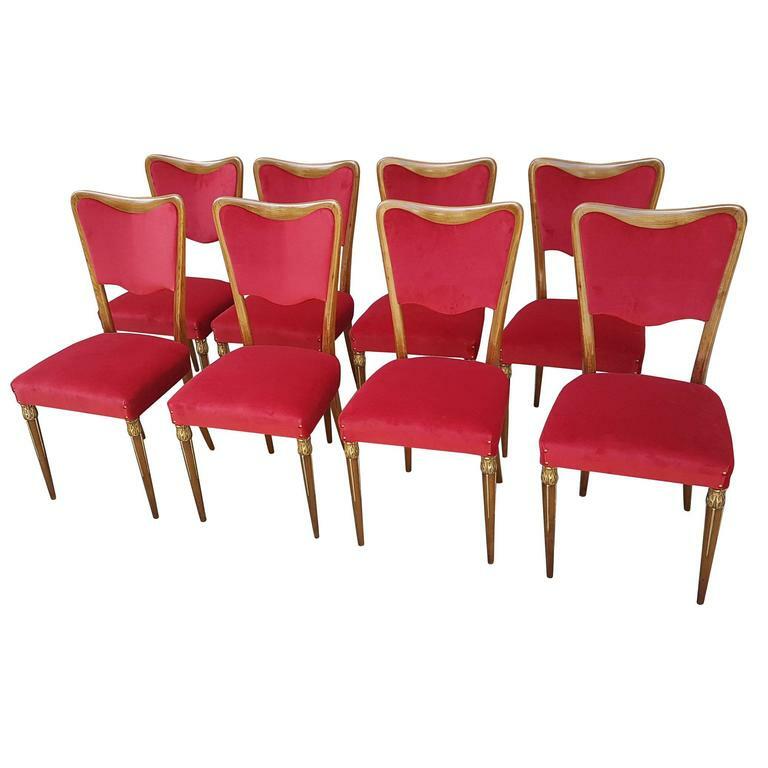 Osvaldo Borsani Varedo Dining Chairs reupholstered with brand new 100% cotton velvet in a vibrant red with a luxurious oak structure and brass ornaments at front base with brass inlay into the front legs. These 20th Century designed Dining Chairs have been restored maintaining their original wood color, authenticity and charm; more information can be found on our dedicated pattern side for Italian Mid Century Furniture at https://www.italianmidcenturyfurniture.com/ where you will discover a wide collection of Mid Century chairs and sofas, lounge chairs, storage cabinets and decor pieces. True historic pieces of art, 20th Century Design & Italian Mid Century furniture. We carefully select unique pieces, from the Art Deco and Post-War Italian Period, restore them through the hard work of a third generation Italian restorer and one skilled Italian upholsterer, and bring them back to life, to be relived again by you. Original 20th Century Design furniture with a particular attention to Italy and the amazing creations of that particular period of our history. Through our dedicated website www.italianmidcenturyfurniture.com you will find a selection of Italian Art Deco furniture and Mid Century design pieces as well as selected antique products and home decor accessories. We do not sell reproductions but original and authentic collector pieces ! When needed, we restore each piece to its natural beauty with the help of an experienced Italian restorer from third generation. We are very passionate in our efforts to maintain the same standards of craftsmanship of the original manufacturers when restoring these little works of art. In our restoration projects we use no industrial machinery, almost all our tools are the very same ones used at the original time of manufacture and throughout the process we follow the original furniture makers' methodology- down to the final layer of varnishing and lacquering. Our paramount concern is to maintain the original integrity of the piece as dictated by the designer and manufacturer. With the exception of parts that are beyond repair and may impede every day use - locks, handles and padding- we substitute no parts. And, because we believe every piece has a history and a life story to tell, we leave the smallest imperfections to remind you. Posted on May 24, 2017 by Modern Italian Furniture Admin and filed under Mid Century Seating and tagged Italian Mid Century Chairs Mid Century Modern Chairs Mid Century Dining Chairs Mid Century Dining Room Chairs Osvaldo Borsani Chairs Osvaldo Borsani Tecno Mid Century Modern Italian Design 20th Century Italian Design. The 70s were colorful, rock and roll and big, the years of exploration and awareness as well as the fights for equality and peace. In Italy, it was the best moment for Italian Design which was started to be celebrated worldwide; think about New York, where in 1972 the Museum of Modern Art put up a full exhibition of Italian Design home products calling it the “New domestic landscape”, furniture was becoming fashionable. Many design pieces have better represented the spirit of that particular period and are still recognized today not only by renowned architects and designers but also by celebrities. Among such pieces, we might remember the Proust Armchair by Alessandro Mendini or Le Bambole armchairs by Mario Bellini for B&B Italia and other designs by Achille Castiglioni, Marco Zanuso, Cini Boeri and Afra & Tobia Scarpa. All of the pieces created by these Italian architects are not only telling us a story today, but they are transferring us that emotional contents which became part of our history. A beautiful design piece from the 1970s was featured in celebrity designer's Malibu home Kelly Wearstler. The Soriana sofa and armchairs by Cassina, designed in 1969 by Tobia Scarpa were graciously erecting from the huge living room area of this magnificent California mansion. The Sofa - The Soriana is an iconic Italian Design Piece, great example of Italian Modernism, won the Compasso D'Oro in 1969 one of the most important design award of that time. The Soriana was manufactured by Cassina in the 1970s and the idea is that to express beauty and comfort by using a whole bundle of fabric or leather hold by single steel clamp. The Soriana Collection is a collector piece and part of the history of Italian Design. Posted on March 15, 2017 by R.M 20th Century Italian Design and filed under Mid Century Seating and tagged Soriana Cassina Sofa Afra & Tobia Scarpa Tobia Scarpa Soriana Cassina Soriana Tobia Scarpa Soriana Sofa Cassina Armchairs Chairs Soriana lounge chairs. The Regent sofa collection by Marco Zanuso, designed for Arflex in 1960 represents one the most coveted design piece of the 20th Century together with the Lady Armchair by the same designer. Our set is unique and rare, and features a three seater sofa with matching armchair on castors completely reupholstered in a luxurious Italian leather. Our team of restorers worked for months on the sofa and armchair to restore these beautiful pieces of design exactly as it originally were conceived. We selected one of the best available leather on the market in a lovely dove color suitable for most home designs. This leather is soft to the touch and highly resistant, comes from European Cattle chrome tanned and full grain finished one of the most expensive of the collection of suitable leathers. Our Italian restorers reproduced every single detail, the vertical stitchings of the back in contrast with the horizontal lines of the seat cushions, the buttons, the line of the bases and so on. You might find some other Regent sofas available on the web here and there, but none of it matches the beautiful details and finishes of our Regent set. Marco Zanuso is a great Italian designer considered to be one of the founding fathers of Italian Industrial Design which brought a revolution in the way Italians lived and perceived every day objects in the 50s and 60s. With great architects and designers from the BBPR offices such as Franco Albini, Pier Giacomo and Achille Castiglioni and Marcello Nizzoli he contributed to the development of the modern movement in the architecture and design field. He was one of the first architect to explore the use of industrial materials in design objects conceived for mass consumption and everyday use. He was director of Domus magazine and Casabella and founding member of the ADI. In 1948 Pirelli created Arflex a manufacturer to produce seating furniture made of foam rubber and industrial material applied to home furniture. Zanies was appointed responsible for the design of this furniture and did not disappoint. He won many awards such as 7 Compasso d’Oro awards and his products are exhibited in modern art museums around the world. In 1960 he designed this exquisite seating collection named Regent, starting with the lounge chair on castors and the matching ottoman. We loved this design for many years and fought to find a sofa and armchair until we scoretwo pieces we were sure would be an amazing designercollector set to own. Like a precious painting or a unique antique car, these pieces are one of a kind and timeless, a milestone in Italian design. Posted on November 12, 2015 by Steffy - Mid Century Modern Italian Design sales team dept and filed under Mid Century Seating and tagged regent sofa arflex marco zanuso regent sofa regent armchair 1960 italian Midcentury mid century furniture. Poltronova was founded by Sergio Cammilli in 1957 and its designs ranged from furniture to home accessories. Immediately Mr Camilli brought a new mindset in the industry as he set out to create a furniture manufacturer that would leave its footprint in the history of furniture design. Starting with Ettore Sottsass Jr, who became his art director in 1958, Poltronova collaborated with a series of great architects and designers who teamed up to create truly one of a kind timeless pieces that are still considered design milestones in the industry. These designers included Gae Aulenti, Giovanni Michelucci, Massimo Vignelli, Paolo Portoghesi, Ron Arad, Nigel Coates and many others. In an effort to combine form and function and change the user experience, Poltronova also began to collaborate with famous artists such as Mario Ceroli, Nespolo, Ruffi and Max Ernst and in so doing left its mark on the art scene. The success of these design efforts is reflected in the multiple industry awards and publications the company has garnered over the years; the Compasso d’Oro in 1957, the publication of the book Fare Mobili con Poltronova in 1970 coupled with the Smau prize in the same year and, finally, the Top Ten prize in 1984. Furthermore, Poltronova participated in numerous landmark design exhibitis and events , such as “La Casa Abitata” in Florence in 1965, "Eurodomus 3" in Milan in 1970, and "Italy: The New Domestic Landscape" at Museum of Modern Art in New York in 1972. Owning piece belonging to the Mid Century Italian Design era, in this case being a Poltronova signature piece, is like being part of modern Italian design’s history. Through the acquisition of Mid Century Italian furniture you will be thrown back to a creative time frame in Italy’s post war modern era. We are proud to present a few of the pieces from the designers that have contributed to the fame and success of Italian design. The complete living collection of Saratoga by Poltronova designed by Lella and Massimo Vignelli is now available. Contact us to purchase this rare collector set. We specialize in authentic Mid Century Modern Italian design, with pieces by world acclaimed Italian architects and designers such as Gio Ponti, Paolo Buffa, Osvaldo Bersani, Marco Zanuso, Franco Albini and many more. Posted on June 19, 2015 by Steffy - Mid Century Modern Italian Design sales team dept and filed under Mid Century Seating and tagged poltronova saratoga sofa chest massimo vignelli vignelli massimo lella sideboard Italian Mid Century furniture Italy design Mid Century Modern Italian design Italian design Modern mid century.